Hard boil your eggs. To get perfectly hard boiled eggs, once the water is boiling, add your eggs and set your timer for 9 1/2 minutes. As soon as your timer goes off, remove the eggs and put them in a bath of cold water. Once your eggs are cooked and shells are removed, set up an assembly line with the beaten eggs, sausage meat and bread crumbs. Now you'll want to take about a 1/4 cup of the ground sausage, form a disk and begin to shape it around the hardboiled egg. Take the sausage-covered egg and dip it in the beaten egg. 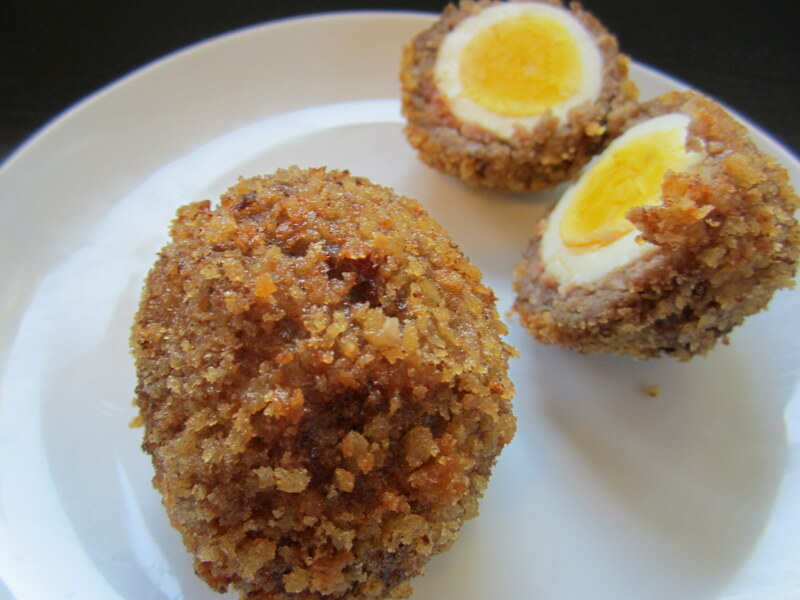 Roll the sausage-covered egg in the bread crumbs until it is generously coated. The final step is to fry those eggs up! Once all of your eggs are coated in the bread crumbs, heat up your oil over medium high heat. You'll know your oil is at the right temperature when you drop a few bread crumbs in the pot and it begins to sizzle. Take care not to add the eggs to the oil to early - if the oil isn't hot enough it will just saturate the bread crumbs and it won't be as tasty. Drop two eggs at a time in the hot oil and cook them until very golden brown, about 6-7 minutes. Make sure you give the eggs enough time in the oil so the sausage fully cooks. Remove the fried eggs from the oil and place on a plate with paper towels to remove the excess oil. Cut the eggs in half or quarters and serve while hot. A perfect combo of a savory snack, sausage, egg and fried food. It's amazing how easy this recipe is.